The following essay was first published in the exhibition catalogue Utopia produced by Mossenson Galleries on occasion of the 2010 Melbourne Art Fair. It was later reprinted in both English and Korean in the exhibition catalogue Josie Kunoth Petyarre & Gladdy Kemarre, produced by Mossenson Galleries on occasion of the 2011 Korean International Art Fair. 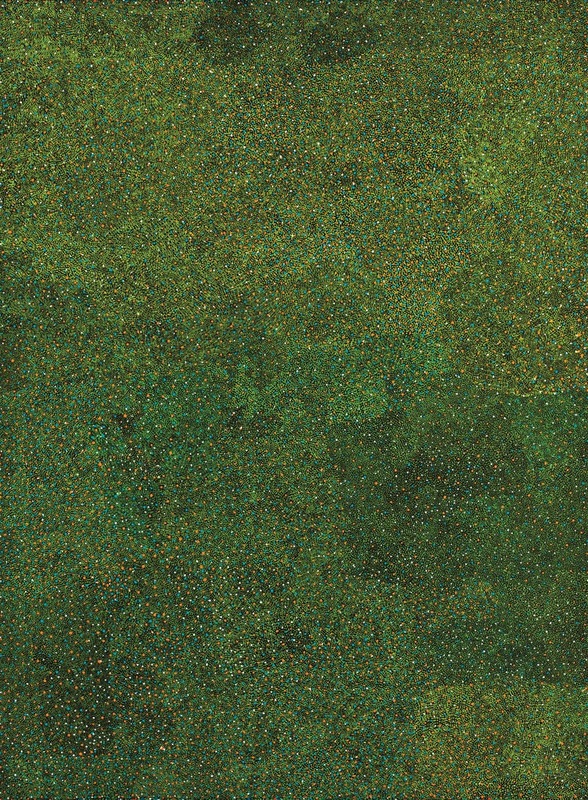 Gladdy Kemarre, Anwekety (Bush Plum), 2011, acrylic on canvas. There is a transformative element to the paintings of Gladdy Kemarre. As we stare into their delicate calligraphy of dots, we could be gazing into the night sky, watching the seven sisters be chased across the Milky Way. If we squint, perhaps we can imagine ourselves looking from the window of an aeroplane as it whisks us over the suburbs of Melbourne, Sydney or Perth. Or perhaps is it a more distant, empty landscape that we are viewing from a great height: a landscape that seems to move beneath us as the shifting light of the sun dances across its open plains. 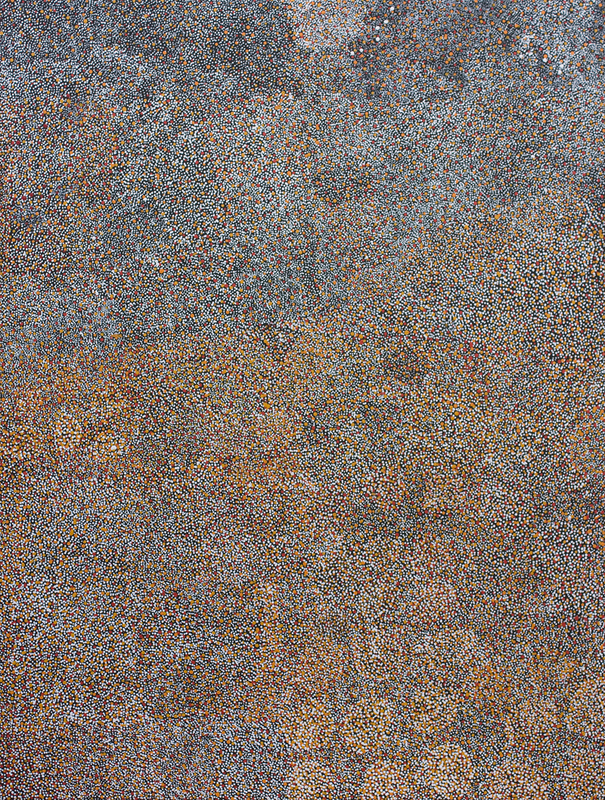 In the paintings of Gladdy Kemarre, the viewer floats into the canvas, just as her delicate skeins of dots shimmer across our horizon. Once immersed, the effect is very literally like that of a dream, the gentle soaring feeling of stepping into the engulfing desert heat, whose thick red winds swelter round the body as though bobbing in a flooded river of extraordinary antiquity. We are transported to places that we have never been, and yet which haunt us with an uncanny familiarity. For in the paintings of Gladdy Kemarre we are transported to her country, a county that she knows intimately; so intimately, that it cannot be expressed in words, but requires a language of intuition and emotion. With a patient refinement, they offer a gentle, motherly reflection on the interconnectedness of all things, a sparkling meditation on the Dreaming as it binds us all together. These are women’s stories, told through generations as part of a contract with the landscape. This contract ensures its fertility, its regenerative power, and its ability to spiritually and physically nourish the Anmatyerre. Gladdy was born around 1950 at Mount Swann in her father’s country. The daughter of Clara Kngwarreye and Kwementyay Pwerle, she was brought up in the Harts Range region with her late sister Ally Kemarre and her brother Billy Benn Perrurle. The siblings grew up learning the traditions of their Anmatyerre people and how to paint through ceremonial body designs. From the 1970s, she was involved in art at Utopia, firstly through the Utopia Women’s Batik Group and later as a painter of considerable acclaim. She was involved in the landmark exhibitions A Picture Story (1988) and A Summer Project (1988-9) and has participated in major exhibitions in Australia, Europe and America. Her works have been acquired by many major public collections, including the National Gallery of Australia, the National Gallery of Victoria and the Art Gallery of New South Wales. In 2009 she was a finalist in the Wynne Prize at the Art Gallery of New South Wales and was awarded first prize in the both the Mount Buller Art Awards and City of Swan Art Awards. This year, Gladdy’s success has continued to rise through her selection as finalist in The King’s School Art Prize, The Stanthorpe Art Prize, The Albany Art Prize, The Fletcher Jones Painting Prize and The Waterhouse Natural History Prize. In a career spanning four decades, a single motif has dominated Gladdy’s paintings, continually finding new expressions, just as the rolling seasons bring new life to the desert. Anwekety or ‘bush plum’ is a Dreaming story given to Gladdy by her grandmother. A type of bush tucker with needle-like leaves and small round edible berries, women collect the fruit into coolamons, to be eaten fresh, dried or mixed into paste. Viewed from above, the changing seasonal colours of the bush plum dominate the flora on the ground in Ahalpere Country. 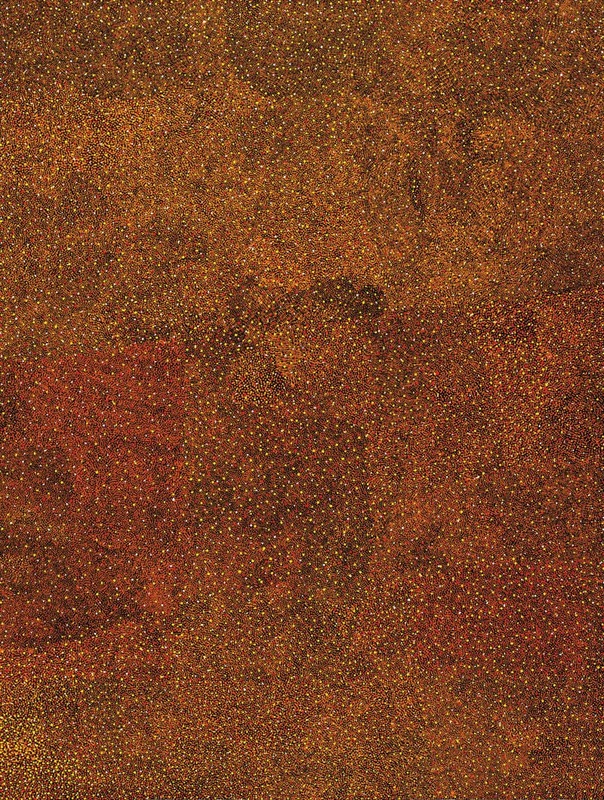 The story of the bush plum is crucial to Alywarre and Anmatyerre women’s ceremonies, and is intricately intertwined with the Dreaming songlines of the whole country. It is a story not only of physical nourishment, but also of spiritual sustenance, being closely connected to the sacredness of Ahalpere Country. Shimmering constellations of fruit emerge in these paintings from tiny points of colour that are meticulously worked into shifting layers that evoke the desert landscape. As a result, they produce a sparkling vision of country that shows the unity of all things – of place, people, flora, ceremony – with the sacred Dreaming. Through their reference to ceremonial body painting and their invocation of the continuum of the Dreaming, the present both a spatial and temporal circularity that acts as a metaphor for the relationship between the local and the universal. The joyful rhythms of the canvas reflect Gladdy’s pride in passing down the story of the bush plum, just as her grandmother did before her, and her keenly felt joy of renewing her traditions. Just as the changing seasons come to renew the landscape, the paintings of Gladdy Kemarre challenge us to transform the way we see the world, to float upon their Dream into the far reaches of the Eastern Desert to the sacred Ahalpere Country.